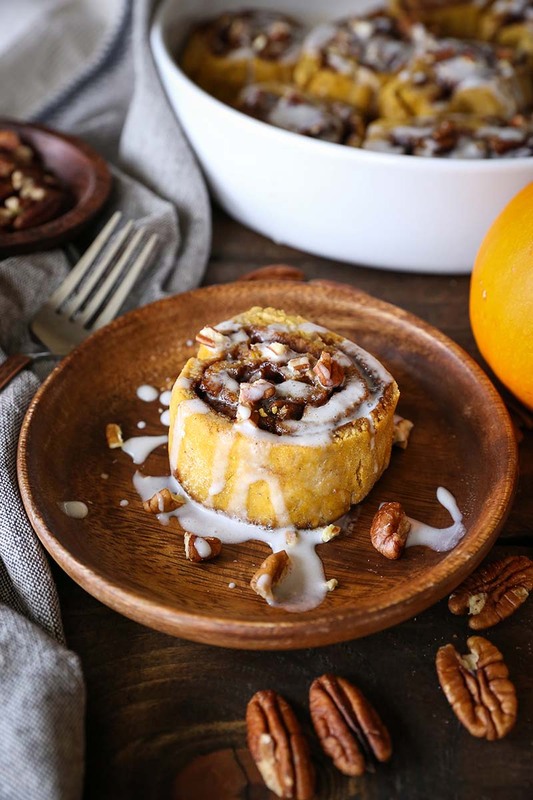 These gluten-free pumpkin pecan cinnamon rolls are refined sugar-free, and can easily be adapted to be dairy-free. With a coconut milk glaze, these cinnamon rolls make for the perfect holiday treat that also happens to be healthy! Heat the coconut milk in a saucepan on the stove top until it reaches 110-115°F. Pour warmed coconut milk into the bowl of stand mixer (or regular mixing bowl if you don't have a stand mixer), and add the yeast, along with a teaspoon of honey. Stir well to combine and allow mixture to sit 5 to 10 minutes, or until very fragrant and foamy. While the yeast is activating, stir together the gluten-free all-purpose flour, coconut sugar, sea salt, cinnamon, nutmeg, cardamom and ground cloves in a mixing bowl until well-combined. Heat the pumpkin puree up just past room temperature in the same saucepan you used for the coconut milk (so long as it feels warm, not hot, to the touch, you're good to go). Add the warm pumpkin puree, melted coconut oil, eggs, and vanilla extract to the mixing bowl with the yeast mixture and turn your mixer on medium-high speed. Beat just until combined. Leaving the mixer on, slowly add the flour mixture until it has all been incorporated and a firm dough begins to pull away from the mixing bowl (Note: if the dough is still sticky after adding all the flour, add a little bit more until the dough forms). Form the dough into a ball using your hands and place it back into the mixing bowl. Cover bowl with a towel and allow dough to sit for 60 to 90 minutes in a warm place to rise. Roll the dough out onto a floured surface until it is about ¼-inch thick and about 15x22-inches. Preheat your oven to 400°F (Note: if preparing these rolls ahead of time, don't preheat the oven. Instead, prepare the rolls according to the remaining instruction, cover the casserole dish with plastic wrap, and refrigerate overnight. The next day, let the rolls sit at room temperature for 1 hour before preheating the oven, then bake according to instructions). Brush the melted butter/coconut oil over the whole surface of the cinnamon roll dough liberally (note: you will likely have some butter/oil left - save it for brushing over the cinnamon rolls before they go into the oven). Stir together the rest of the filling mixture (coconut sugar, chopped pecans, cinnamon, nutmeg, and allspice) in a small bowl, and evenly sprinkle this mixture over the buttered dough. Starting with the short end, roll the dough tightly, creating a log (note: with gluten-free flour, this process will be a little difficult, as it will want to break apart. When this happens, gently push the edges of the dough back together). Bake in the preheated oven for 15 minutes, or until rolls are golden-brown and firm to the touch. Drizzle with coconut glaze (instructions below) and serve warm, fresh out of the oven! While the cinnamon rolls are baking in the oven, stir together all of the ingredients for the coconut glaze in a small bowl. Taste for sweetness and add more pure maple syrup or honey to taste. Refrigerate until ready to use. Recipe created byThe Roasted Root. You can make these cinnamon rolls fully dairy-free by using coconut oil in the filling, rather than butter. After you form the rolls and place them in a casserole dish, you can either stick them in the oven right away, allow them to rise even longer, or cover them with plastic wrap and refrigerate overnight. For those of you who want to prepare these rolls for breakfast or brunch, make the recipe the night before and bake the rolls off in the morning in order to lighten the prep load. You can easily replace the pecans with walnuts, or omit the nuts altogether.